If you're restoring a vehicle, a major milestone in the process is when you paint the vehicle. At that stage, although still far from finished, the project really starts to take shape. Depending on your skill level and ambition, you may wish to tackle the paint job yourself. If you've never painted before, the idea of painting your vehicle may seem like a fun project, or it may seem overwhelming. Although there are proper techniques to learn about spraying, nothing is out of the scope of a hobbyist who is willing to practice and learn. To get you started, Eastwood offers books and DVDs, paint guns, paints, supplies, and all the technical advice (see the Eastwood How To Center, Forums, Blog or YouTube channel) you need to paint your vehicle. When you see your freshly painted vehicle, the sense of accomplishment will be your greatest reward. Different people have different reasons for wanting to paint their cars. Maybe you want to say you did "all" the work yourself, maybe you cannot afford to have it painted, maybe you want to learn something new, maybe you want to be certain of the work that's going into the vehicle before and during painting...the list goes on. Regardless of your reasons, there are certain things that need to be considered for a successful paint job. To get started, you need to develop a game plan. The key to a successful paint job is planning your steps, taking your time, and properly prepping the surface. If you're in a hurry, DO NOT attempt to paint your car. If you cut corners prepping the vehicle for paint, it will be very noticeable in the final finish or shortly down the road. To properly paint a vehicle, there's a lot more involved than spraying paint onto the vehicle. Do you have a place to prep and paint the vehicle? 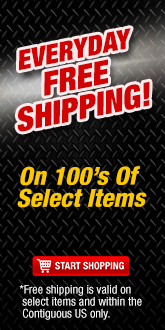 Do you have (or are you willing to purchase) the needed tools to paint a vehicle? 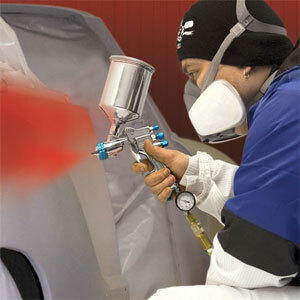 Are you painting the complete vehicle (door jambs, trunk area, underhood, etc) or only the outside? Will the vehicle be stripped to bare metal, or are you going to paint over the existing finish? What type of paint do you plan on using? Single stage, base coat/clear coat? Urethane, acrylic enamel, acrylic lacquer, water-based? What brand of paint system are you going to use? If you're considering painting your vehicle, first think of where you're going to prep and spray it. Do you have a dry place to store the vehicle while you are prepping it? Ideally, you'll want to spray in a clean, dirt-free, temperature-controlled environment. Are you going to rent a spray booth, paint in your garage, or paint in your driveway? Is it legal to spray a vehicle there? All of these factors must be considered before you think about picking up a paint gun. Tip: if it's illegal to paint your vehicle in the area you live, you can still strip it down and prep it for the body shop. It's a good way to save money. You'll need the proper equipment to paint a vehicle. At a bare minimum, you'll need a paint gun, an air compressor that can meet the demands of your paint gun, and a moisture separator. The moisture separator will ensure that you have a dry air supply (moisture in your air supply is an easy way to ruin a paint job). Another option is a turbine paint system, such as the 5 Stage Turbine. 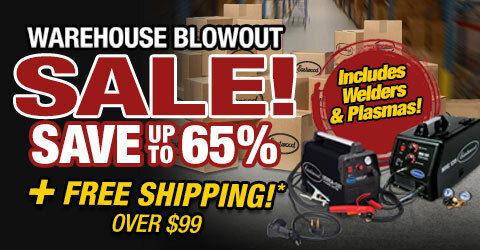 It does not require an air compressor, and ensures that you have a dry air supply. There are two general paint gun designs: HVLP gravity-feed and siphon-feed. Gravity-feed guns have the cup mounted on top of the gun, and siphon-feed guns have the cup mounted under the gun. Due to environmental rules these days, most paints are formulated to spray with a HVLP gun, and luckily for home users many of these spray just fine with a smaller home compressor. 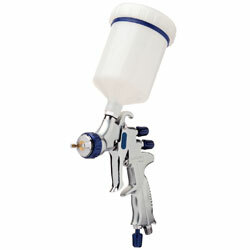 For more on types of spray guns, check out this expert blog post on the Eastwood blog. In addition to the spraying equipment, you'll also need safety equipment like painter's coveralls, an approved respirator, goggles, and disposable nitrile gloves. For a much more comprehensive explanation of painting safety gear, click here. When deciding to paint your vehicle, how much will you take the vehicle apart? Are you going to remove the hood, trunk, doors, glass, etc., or are you going to tape it up and paint while it's together? Taking everything off allows you to make sure there's no hidden damage, and it allows you to get paint into nooks and crannies. However, you'll have to deal with gapping the panels, reinstalling glass, replacing seals, etc. If you decide to paint the vehicle while it's still together, remove as many of the small parts as you can: antennae, door handles, lights, locks, wipers, etc. If you're leaving parts on the car that are not going to be painted, be sure to use high-quality automotive masking tape and masking paper...newspaper doesn't cut it. Tip: to get paint under installed seals, take some nylon clothesline or coated wire and put it under the seal, and then mask off the seal. This will lift the seal enough to allow paint to spray between the seal and the body of the vehicle. 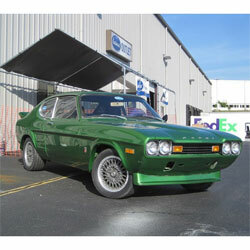 Do you plan on stripping the vehicle to bare metal, or painting over the existing finish? Stripping the vehicle to bare metal allows you to see what is hiding under the paint: rust, body filler, shoddy repairs, and other damage. Bare metal also allows you to know exactly what products are being used. If you paint over an existing finish (perfectly acceptable for some applications), you never really know what's hiding under the surface. Also, if this old finish was not properly prepped, your new coating may flake off due to the existing finish flaking off. If you don't know the history of the finish on the vehicle, it's generally a better idea to strip it to bare metal and start fresh. When painting over an existing finish, the finish must be in good shape. Faded finishes are okay, but should not be peeling, cracked, or otherwise damaged. If the vehicle has been repainted, we recommend you strip the vehicle down and start from bare metal. If you do decide to paint over the existing finish, wash the vehicle and then use a high-quality wax and grease remover like PRE Painting Prep on the surface. This will remove any wax that could cause adhesion problems. A large part of a successful paint job is directly related to proper preparation. Painting a vehicle is a time consuming process that involves a lot of prep. If you do not properly prepare the vehicle for paint, you'll see defects in the finish, and there may also be adhesion issues. In terms of preparation, we're referring to rust repair, damage repair, bodywork, block sanding, using the correct products, keeping the surface clean, proper sanding, etc. If you're willing to put in the time and work, the end results can make it worth all your effort. No matter where you start, proper prep is essential, read all about it on this recent blog post. Depending on the purpose of your project, you might select different types of paint. With restoration projects, many hobbyists opt for acrylic lacquer or acrylic enamel to replicate the original factory finish. If you're looking for durability, urethanes, base coat/clear coat finishes and water-based finishes are great choices. Before you start to spray, be sure to read the paint-mixing instructions and paint gun instructions. Be sure your paint gun is set-up to spray the type of finish you are using. If you've never painted before (or even if you have), you may want to look into our Paintucation videos, or even the many videos on the Eastwood YouTube page. These videos show you how to avoid common mistakes, and present a wealth of information. Generally, it's recommended that you stick with one brand's paint system throughout the entire painting process. However, there have been many successful paint jobs that have mixed products. If you decide to mix primers and topcoats from different manufacturers, we recommend you test for compatibility before you start spraying on your project. Tip: Eastwood's line of primers, paints and clearcoats are high-quality products that work well with most paint systems. For repairing wavy panels, Contour Polyester Primer Surfacer is also a versatile, high-build, sprayable, polyester primer that can be used with most types of topcoats. It can be applied over bare metal or prepped painted surfaces. Be realistic with your expectations of your first paint job. It probably won't be perfect. There might be dry spots, runs, dirt, and/or bugs. Take your time and remember that many of these problems can be corrected with color sanding and buffing. Use each paint job as a learning experience. With practice, the right equipment, the right products, and Eastwood's expert advice, you'll be able to produce a paint job to be proud of.